Aim: The aim of this study was to evaluate the clinical outcome of teeth submitted to odontoplasty during clinical crown lengthening surgery (CCLS), when compared to their contralateral non-operated teeth. Materials and Methods: Fourteen patients submitted to odontoplasty during CCLS were evaluated according to plaque index, bleeding on probing, probing depth and final restoration outcome (total success, relative success and failure). Results: The mean follow-up period was 13.57 (± 8.00) months, and ranged from 6 to 24 months. Twelve cases presented total success of the final rehabilitation and 2 cases presented relative success. The cases of relative success were due to the necessity for a new periodontal intervention (scalling). No differences were observed with respect to periodontal parameters (P>0.05) and the patients that showed relative success presented generalized poor oral hygiene. Conclusions: The odontoplasty during clinical crown lengthening surgery is a feasible procedure in the management of extensive crown destruction. The most commonly used techniques for biological width reestablishment are the clinical crown lengthening surgery (CCLS), orthodontic extrusion and the association of both procedures. The advantages of the aforementioned surgical technique are the decreased time for final restoration and the reduced number of clinical sessions. On the other hand, when compared to orthodontic extrusion, a greater supporting bone removal is necessary and the soft and hard tissues of the adjacent teeth are frequently involved during the surgery. Although the orthodontic forced eruption preserves supporting bone and the adjacent teeth, the prolonged treatment time, the reduction of tooth insertion and the need of an orthodontic apparatus  may be limitations to the clinical use of this technique. Previous studies have suggested that a distance of 3-5 mm, from the alveolar bone crest to the crown/restoration margin, is required to accommodate the newly formed supraosseous gingival complex and to permit proper restorations. , In some cases, an odontoplasty (i.e. wearing of the dental surface creating a smooth supraalveolar area) may be a useful maneuver during the clinical crown lengthening surgery. , This approach enables the re-establishment of the dentogingival union with decreased bone removal  [Figure 1]a and b. Caries and fractures close to furcations, the necessity for excessive supporting bone removal with conventional CCLS, radicular length reduction (observed in forced eruption) and aesthetic damages may be indications for the performance of odontoplasty. However, to date, there is no available evidence evaluating the clinical outcome of a series of cases treated by using odontoplasty associated with CCLS. Thus, the aim of the present study is to retrospectively evaluate teeth submitted to odontoplasty during clinical CCLS, when compared to their contralateral non-operated teeth. After the evaluation of clinical records of patients assisted at the UFPel School of Dentistry between two years, 16 subjects were selected for this study. The following inclusion criteria were used: 1-individuals submitted to CCLS, performed by the same operator that carried out odontoplasty in at least one tooth; 2-non-smokers, non-pregnant or lactant and systemically-healthy subjects; and, 3-periodontally-healthy individuals, presenting full-mouth plaque index (PI) and gingival index (GI) lower than 20% at the moment of the surgery. Probing depth measurements were used as a reference for marginal tissue removal. After local anesthesia (2% lidocaine with 1:100000 epinephrine), an internal bevel incision was accomplished around the teeth for dental margin exposure [Figure 2]b. An intrasulcular incision was then performed, a mucoperiosteal flap was reflected and the gingival tissues were removed to allow the visualization of the bone and the dental margins [Figure 2]c. All the cases evaluated in the present study showed a wrinkled area with irregular outlines due to the fracture, caries or subgingival prosthetic preparation. A slight osteotomy using a mini Ochsenbein chisel enabled the visualization of fracture limits that were planed by a 30-blade bur 9714FF and 9904FF (KG Sorensen, São Paulo, Brazil) and periodontal curettes (Hu-Friedy Co, Chicago, IL, USA) to create a supraosseus area of 3 mm or more [Figure 2]d. The soft tissues were adapted with interrupted simple sutures [Figure 2]e. Chlorhexidine gluconate (0.12%) mouthwash was prescribed twice a day for 2 weeks and analgesics were prescribed to control post-operative discomfort. The sutures were removed at 7 days post-surgery. [Figure 2]f, g and h show the post-operative condition of one case at 1 week, 6 months and 16 months after surgery, respectively. Periodontal probing at 6 and 16 months follow-up period revealed a clinicaly healthy gingiva. The examination was performed by a single examiner (periodontist) trained and calibrated for the study. The intra-examiner agreement was > 0.80 according to the Kappa-Light test. The following clinical parameters were measured: Probing depth (PD): Measured from the gingival margin until the bottom of the gingival sulcus/pocket (using intervals of 0.5 mm); Plaque Index (PI):  Presence (1) or absence (0) of visible plaque; Bleeding on probing (BOP): Presence (1) or absence (0) of bleeding of up to 15 seconds after gentle probing. When classified as 2 or 3, an additional classification was used, according to the necessity of an additional dental intervention: A - Periodontal: Sub or supragingival calculus accumulation, and/or probing depth higher than 3 mm, associated with BOP at the operated area; B - Endodontic: Periapical lesion, sinus tract and/or painful symptomology; C - Restorative: Marginal infiltration, secondary caries or fracture of the restoration; D - Dental Fracture; E- Fracture caused by trauma; and, F - Other reasons. Data was analyzed by using statistical software (BioEstat 3.0, Sociedade Civil Mamirauá, CNPq, BR). The mean PD of the sites involved in the odontoplasty and their respective sites on the contralateral teeth were computed for each tooth. PD of the teeth submitted to odontoplasty was compared with those of the contralateral teeth by the Mann-Whitney non-parametric test. McNemar test was used to compare the frequencies of failure, their reasons, PI and BOP. Fourteen out of the sixteen selected subjects attended the clinical evaluations. Fourteen teeth were included in the study, being 3 lower (all first molars) and 11 upper teeth (4 central incisors, 1 lateral incisive, 1 canine, 3 premolars and 2 molars). [Table 1] shows the teeth included in the study, the reason for the surgery, the sites involved in the odontoplasty, the follow-up period and the type of restoration. The mean follow-up period was 13.57 ± 8.00 months (mean+standard deviation), and ranged from 6 months to 24 months. During this period of evaluation, no treated tooth was lost and no restorative procedure had to be repeated. With respect to final rehabilitation outcome, until the present moment, 12 patients were classified with score "1" (total success) and 2 with score "2" (relative success). The "2" scores were due to the necessity for a new periodontal intervention (score A). One patient received supragingival scaling in the operated area and another received subgingival scaling. 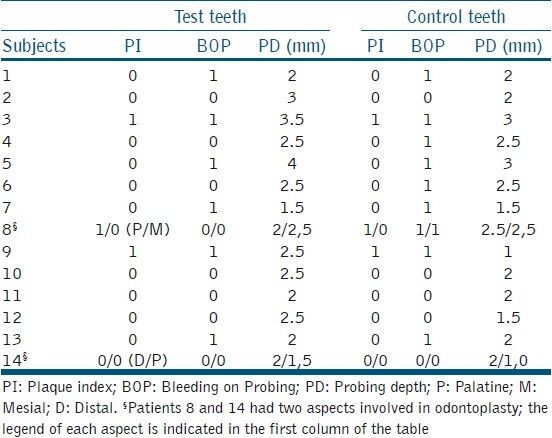 With regard to the periodontal parameters [Table 2], no statistically significant differences were observed for PI, BOP and PD between the operated teeth (test), and their respective non-operated contralateral teeth (P>0.05). 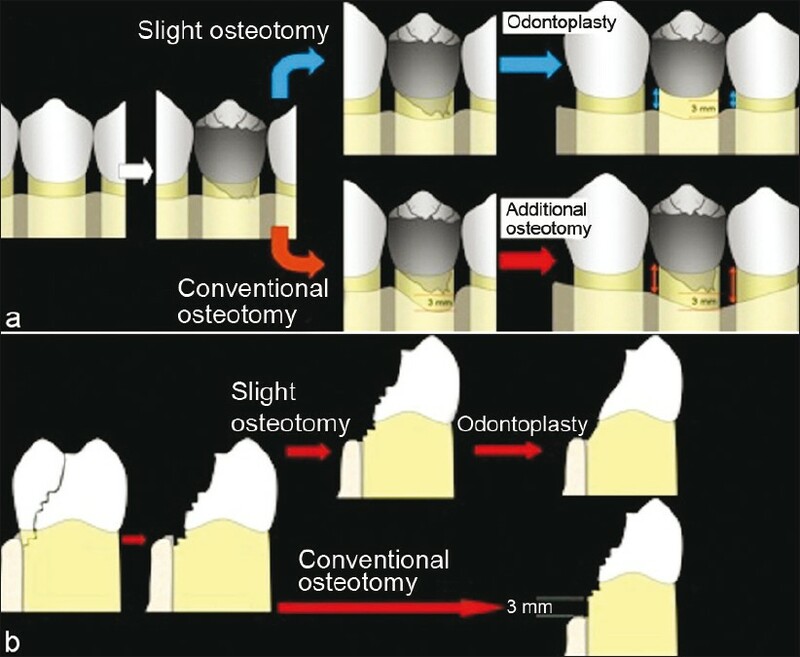 The great benefit of the odontoplasty technique is the reduced necessity for osteotomy [Figure 1]a and b. The requirement for bone preservation has progressively become important with the advancements in titanium dental implants. Thus, if rehabilitation failure and consequent tooth loss occur, the implant remains as a second alternative and can be placed in a region where the bone structure was preserved. Although odontoplasty was initially described in 1982 as a restorative alveolar interface (RAI),  evidence of the success of this technique on a long-term basis is very scarce. Additionally, data regarding the outcome of odontoplasty in the buccal or palatal sites of the teeth are even more limited. Therefore, this case series focused on the clinical outcome of teeth submitted to odontoplasty, predominantly in the buccal or palatal sites. The periodontal parameters revealed that the operated teeth behaved similarly when compared to their non-operated contralateral teeth (controls). This finding suggests that the modification of the anatomy in the operated sites did not affect the periodontal health. In fact, according Ross et al.,  a normal healing occurs when odontoplasty is accomplished in proximal areas, a technique known as RAI, which follows the same principles as the technique used in the present study for buccal and palatal aspects. Histological studies in dogs, evaluating the RAI technique, showed a similar healing pattern when odontoplasty areas were compared to areas of periodontal surgery without odontoplasty. , Our positive clinical findings may also be related to the hygiene instructions taught to the patients; and, patients were motivated to modify their brushing technique and to use a tuft toothbrush when a dental unevenness among the adjacent teeth and the operated ones was observed. One of the patients presented 4 mm of probing depth, associated with gingival bleeding, in the operated site; though initially it was suspected that odontoplasty could have influenced the periodontal condition, a complete examination of the oral cavity revealed a clinical picture of widespread gingivitis. One limitation of the present investigation is that, as a retrospective study, it was not possible to standardize the restorative materials and intra-radicular retainers. In addition, mono and multiradicular teeth were included in the present evaluations. On the other hand, great care was taken with the choice of the surgical technique and restorative planning. The present clinical retrospective investigation suggests that both anatomical alteration and thickness reduction, promoted by odontoplasty, seems not to be critical for periodontal health and restorative success. However, further studies are necessary in order to evaluate the outcomes of odontoplasty in a larger sample size and during the long-term. In addition, the wear magnitude, the occlusal stability, the dental group and the type of rehabilitation also needs to be assessed in future studies. Therefore, it can be concluded that odontoplasty during CCLS is a feasible procedure that does not affect periodontal health and the long-term prognosis of restorative procedures. 1. Gargiulo MF, Wentz FM, Orban B. Dimensions and relations of the dentogingival junction in humans. J Periodontol 1961;33:261-7. 2. Ingber JS, Rose LF, Coslet JG. The "biologic width": A concept in periodontics and restorative dentistry. Alpha Omegan 1977;70:62-5. 3. Lakshmi S, Krishna VG, Sivagami. Prosthodontic considerations of endodontically managed teeth. J Conserv Dent 2006;9:104-9. 4. Waal H, Castelucci G. The importance of restorative margins placement to the biologic width and periodontal health. Part I. Int J Periodont Rest Dent 1993;13:461-71. 5. Waal H, Castelucci G. The importance of restorative margins placement to the biologic width and periodontal health. Part II. Int J Periodont Rest Dent 1994;14:71-83. 6. Bader JD, Rozier RG, McFall WT Jr, Ramsey DL. Effect of crown margins on periodontal conditions in regularly attending patients. J Prosthet Dent 1991;65:75-9. 7. Schatzle M, Land NP, Anerud A, Boysen H, Burgin W, Loe H. The influence of margins of restorations of the periodontal tissues over 26 years. J Clin Periodontol 2001;28:57-64. 8. Lindhe J. Clinical Periodontology and Implant Dentistry. Copenhagen: Blackwell Munksgaard; 1997. 9. Becker W, Ochsenbein C, Becker BE. Crown lengthening: The periodontal-restorative connection. Compendium 1998;19:239-54. 10. Ross SE, Gargiulo A. The surgical management of the restorative alveolar interface. Int J Period Rest Dent 1982;2:8-31. 11. Stoll LB, Novaes AB, Lopes RA. Modification of col shape and interproximal area after periodontal surgery associated with the restorative alveolar interface technique. Histological study in dogs. Braz Dent J 2001;12:147-53. 12. Cruz MK, Martos J, Silveira LF, Nova Cruz LE, César Neto JB. Odontoplastia associada à cirurgia de aumento de coroa clínica na reabilitação de extensa fratura corono-radicular com invasão de espaço biológico. Rev Assoc Paul Cir Dent 2008;62:444-8. 13. Ainamo J, Bay I. Problems and proposals for recording gingivitis and plaque. Int Dent J 1975;25:229-35. 14. Kishen A. Mechanisms and risk factors for fracture predilection in endodontically treated teeth. Endod Topics 2006;13:57-83. 15. Ross SE, Gargiulo A, Crossetti HW, Phillips DJ. The surgical management of the restorative alveolar interface (II). Int J Period Rest Dent 1983;3:8-19. 16. Papalexiou V, Novaes AB Jr, Macedo GO, Luczyszyn SM, Muglia VA. Preprosthetic periodontal surgery in the proximal area with modification of the COL área: Results following the reestablishement of the contact point. J Periodontol 2006;77:1856-62. Cesar-Neto, J.B. and Martos, J. and Artifon, L. and Silveira, L.F.M. and Michelon, D. and Masotti, A.S. and Silva, J.C.M.